I’m pretty sure that all time management experts recommend using a personal planning system of some sort. It can be anything: an electronic planner, your smart phone, a paper planner (my personal favorite), your computer or tablet, or even notebooks, steno or legal pads, or index cards. It doesn’t matter what you use as long as you use it and it works for you! Just because the planner provides lines for you to write on doesn’t mean you have to write on them. My planner’s lines are too narrow so I use two lines instead of one. Just because the “box” says it’s for the prioritized task list doesn’t mean you have to write the task list there. Just because another area says it’s for appointments doesn’t mean you can’t put to do items there, too. Just because an area is blank and isn’t supposed to be written on doesn’t mean you can’t. You can write in your planner any way you want! I’ve been using a planner for a very long time – I can’t function without it. Just ask my family. That being said, I’m not sure I’ve ever used my planning pages the way they’re supposed to be used. But my modifications worked for me. Below are six examples of different ways I’ve used my planner over the years (and sometimes in the same week!). 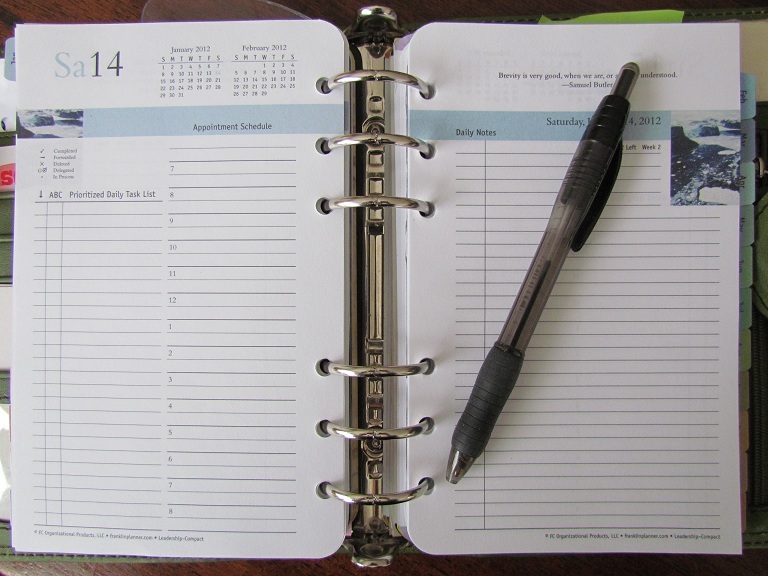 I’m hoping these examples will give you ideas for how you can better use your planner. Example 1. 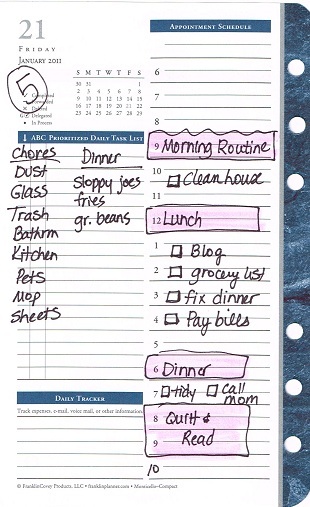 This example uses the planner page as intended. You make a list of everything you need to do and then prioritize the list using A, B and C and 1, 2 and 3. A’s are items that MUST be done that day or bad things will happen. B’s are items that you should do. C’s are things that you can do if you have time. If you don’t do them, nothing will happen. I personally have a very hard time prioritizing in this way. If your list consists only of “extra” things you needed to do, like pay bills, schedule an appointment, etc –this method is easier. But I include pretty much everything I need to do and it’s hard to decide whether dinner is more important than laundry and which should be done first. So I’ve never done my list this way. But I know a lot of people have success with this method. Example 2. On this page, my list consists only of items that must be done that day. 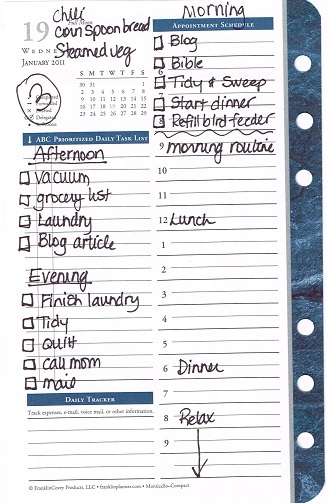 In the bottom section, the daily tracker, is a list of the daily things I need to do. On the top right of the page is a reminder of a friend’s appointment so I can follow up. On the top left is my menu. Example 3. On this example I divided my day into sections and made my list based on what I hope to accomplish during each time segment. Again my menu is on the top left. Example 4. 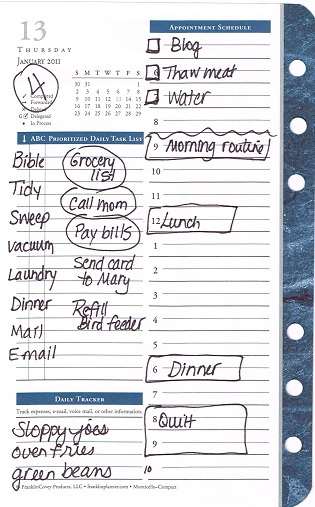 On this example, in the prioritized daily task list section I have one column of daily chores and one column that is all the other things I would like to do. The circled items (you could also put an asterisk by them) are items that are very important. My menu is in the daily tracker. And the area at the top right includes things I need to do as soon as I get up. Example 5. 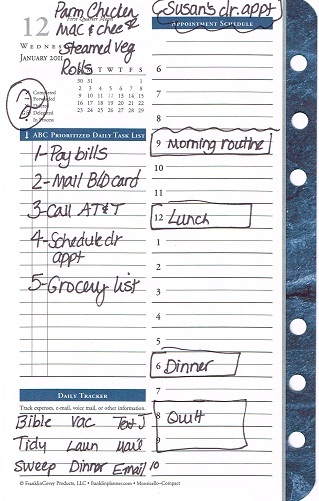 On this example I use the appointment schedule to record my to do’s. I plug in the things I have to do at set times and highlight them so they stand out. Then in the spaces between, I write what I’m planning to do during that time period. 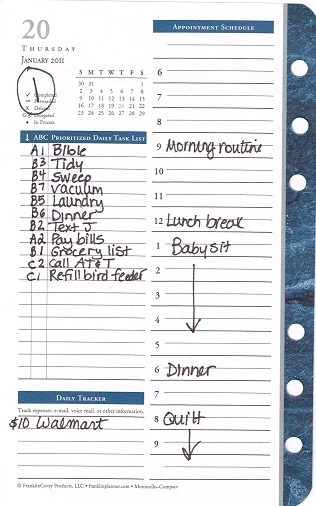 I use the prioritized daily task list area for details about those items. Example 6. 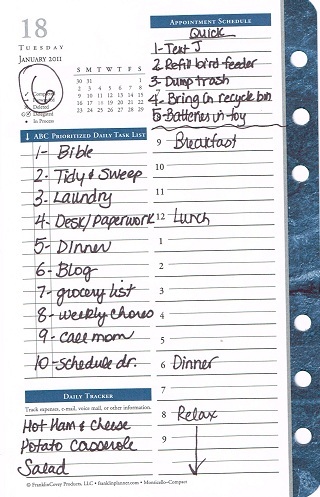 On this example, I limit my list to only 10 things that are important for that day. I have more things I would like to do but setting a limit helps me focus on the most important things. When I’m making my list (it’s a good idea to use pencil), sometimes I have to erase something in favor of something else that I decide is more important. The list at the top right includes about 5 things that can be completed very quickly. I’ll do those when I have a minute between tasks. If I happen to complete all 10 items before the end of the day (I don’t think that ever happened), then I’ll make a list of 5 more. Again, my menu is in the daily tracker section. So just because the planner page designates certain areas for certain things doesn’t mean you have to do it that way. Don’t be afraid to modify your page so that it works for you! You should never be a slave to the planner. The planner is your servant! Make it work for you!